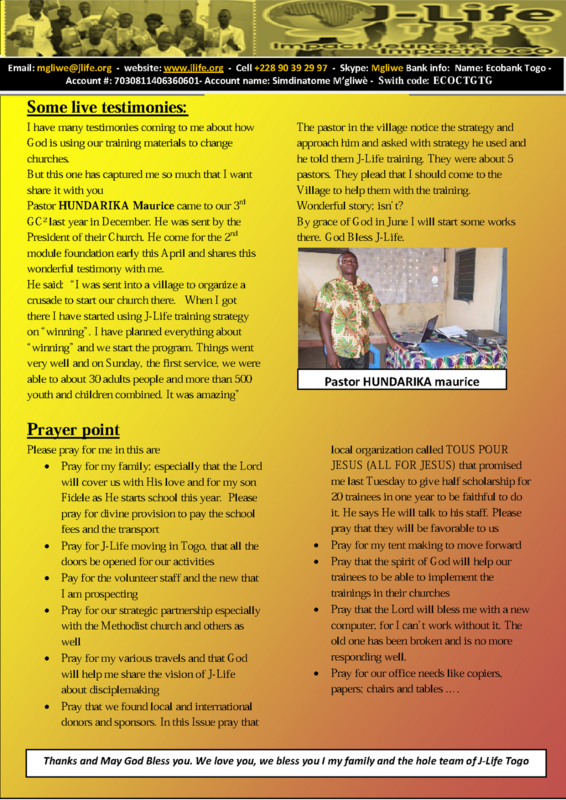 J-Life Africa exist to equip and mobilize the local Church in Africa to run Christ centered disciplemaking youth movements that will impact the local and global community. 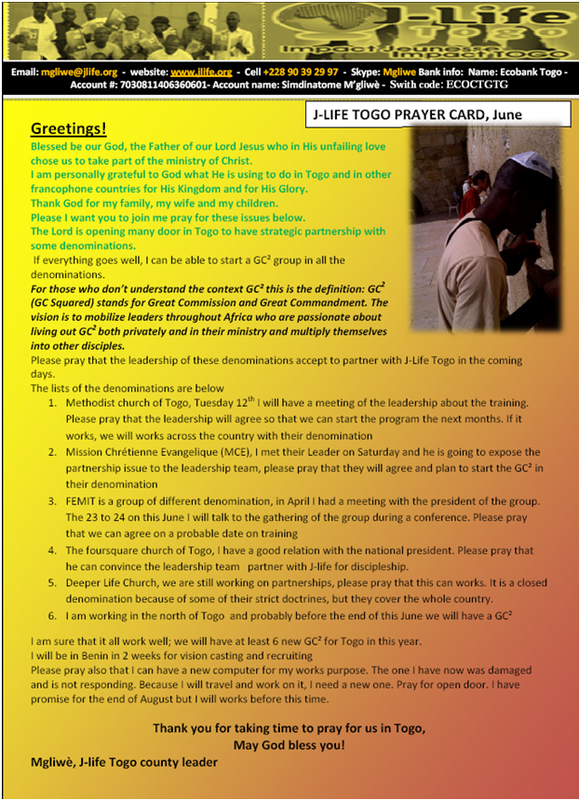 We are a non-denominational movement that exists to train leaders to mobilize disciplemaking movements across Africa. We believe that the most effective way to bring life transformation is not through the age-old "seminar" or "lecture" model, but rather through "life-on-life" mentoring and coaching. The "life- on-life" concept is based on spending more time with trainees. The more time we spend in close relationship with the trainees, the more we will transfer the DNA of Christ. But the importance for us is not the content as much as the coaching and mentoring for life change and impact. J-Life seeks to mobilize leaders that want a holistic approach to the wonderful news of Christ, an approach that will transform communities. To effectively fulfill our purpose we believe that the following four ingredients need to be evident in all that we do. This ingredient highlights the importance of relationships in mobilizing leaders and workers. The sooner a connection between trainer/coach and trainee can be established, and the deeper this relationship can be, the greater will be the transfer of the DNA. This involves a multi-faceted transfer of the DNA to trainees. J-Life believes that this "impartation" cannot happen in isolation and has to occur in the context of the other ingredients listed herein. Other words for 'impart' are: pass on, communicate, inform, tell, convey, teach, instruct, divulge, disclose, reveal, expose. As a ministry, J-Life is responsible to not only "impart information" but also to ensure that the trainee is coached and mentored in the implementation of this information. 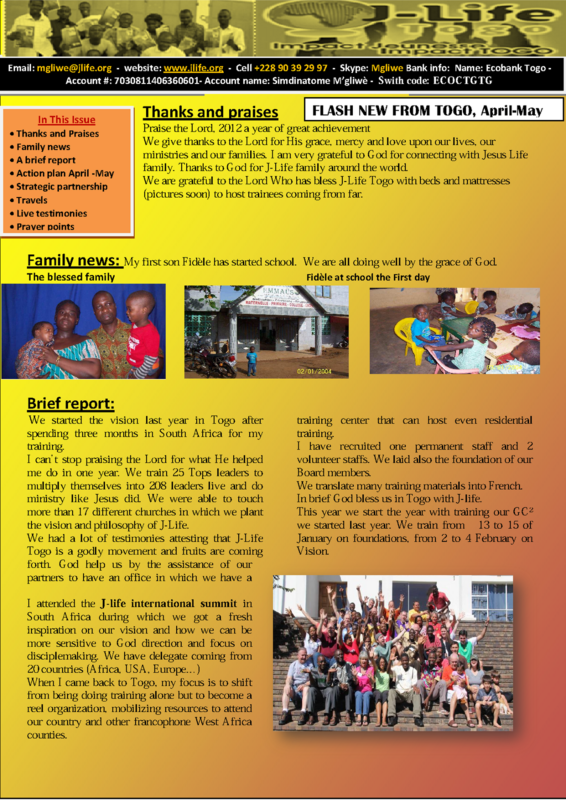 J-Life will endeavor to provide resources and assistance to those individuals with whom J-Life has in some way been able to "connect, impart and equip". This is done to enable these individuals to fulfill a calling that resonates with the core values and ministry beliefs of J-Life. 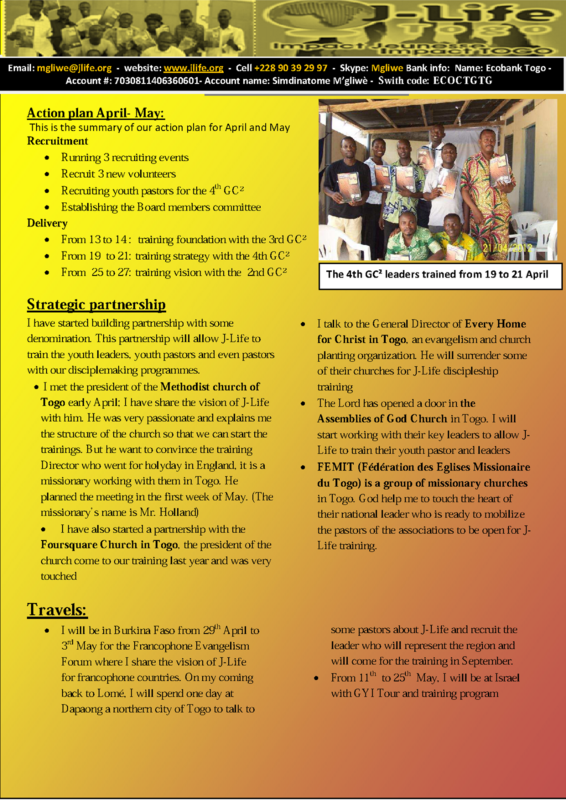 Jesus Life Revolution Project is a life transforming program developed in Togo and can be transfer to other French speaking countries in West Africa to equip young people in local churches to know the reality of Jesus life and live Him like every single day. We believe that it is the will of God for every believer to be like Christ and live like Him. This is the essence of discipleship. But today in most of our churches, the focus is not on Christ but on doctrines and human traditions. And in our regions, many missionaries who came based their works on evangelization that gave birth to many churches. These churches are modeling themselves into daughter churches without a strong Fondation of discipleship. The result is that we have superficial Christians who don’t have any deep root on Christ. They can live every kind of life and still call themselves Christian and they can’t even reproduce themselves into other people to take them to maturity. They can easily renounce their Christian faith and be converted to another attractive religion. The Jesus Life Revolution Project is establish to be a tool that the Lord will use to awake youth and build them and coaches them to live and be like Jesus. They will then reproduce themselves into other people and will activate a revolution on Christ living in their churches. We want to see in every church a new challenge of focus on Christ radically intentionally. The project will be run like a camp program. Three camps encounters of three days in a year with a selected young people in different churches. They will after all reproduce themselves in other young people in their churches. All the three camps are linked because it will be continuity from the first session. If the first camp is missed, a new comer cannot continue in July or December. He needs to wait to start the next year. The participant’s numbers will not exceed 33 people. While J-Life Africa general programs targets youth leaders and pastors, the Jesus Life Revolution project aims to touch every believer who need to be rooted in Christ and live the rest of his live to serve Him freely. During the year program, J-Life Africa general DNA will be taught mastered by the trainees. For the project to be a real life changing program and to have an eternal impact, we will manage an accountability groups of 5 to 6 persons in which every participant will be. The accountability group will continue to meet on a monthly base during the whole year of training. And for each group a mentor will be given to lead and coach the youths in their development process. The mentor is an above reproach mature Christian nominated by at least three witnesses. They will volunteer to follow the trainees during one year according to J-life vision and DNA. After the impact of the year, each trainee is asked to select three people from his church or school to start the same journey. The project will last five years. After that, a new strategy can be established or renewed. 1. Fund raising to support project and participants who cannot pay the total or half or the training fees. Not every participant can pay the training fees that are normally 378, 75 per person per year. We will ask youth to pay only 50 Dollars out of the 378, 75. The remaining 328, 75 is what we will raise to support the project. The fund raising event will take place every year to cover the year activity. We will raise funds locally and internationally. When Jesus was going to the father, He asked us to make disciples of all nations and teach them to obey. This is our mission. To be a disciple means first to display the character of Jesus and second to live His priorities. The Jesus Revolution Project is established to equip the local churches with a movement of intentional disciple-makers who will reproduce them into other Christian. The project is a revolution of Jesus life. Jesus is our ultimate model for life and ministry. We are very sure that discipleship revolution is what our local churches need now. From February 2nd to 4th we have our third GC² training which is vision. Youth leaders and youth pastors are recruited for one year program. The purpose of the training is to help youth leaders and pastors to establish in their churches a disciplemaking movement in their local churches based purely on the life and the ministry of Jesus. Understand your identity as a Spiritual leader. We look at the character, competency, and the calling of the Christian leader. Help you identify your personal passion and ministry vision. Assist you with developing a two-year ministry plan according to the key priorities of Strategy and Foundations. We have purposefully scheduled in our training plenty of time for interaction, personal reflection and ministry planning. This is the picture of the trainees.